THE HAGUE: Dutch Prime Minister Mark Rutte looks set to lose his senate majority after upstart populists surged in provincial elections just two days after a suspected terror attack in Utrecht. Controversial eurosceptic Thierry Baudet’s Forum for Democracy (FvD) party came from nowhere to be the second biggest in parliament’s upper house, an exit poll by leading broadcaster NOS said. The blow for Rutte – who painstakingly formed his ruling coalition to freeze out the far-right after general elections in 2017 – will be closely watched abroad ahead of European Parliament elections in May. After eight years in power Rutte is an influential figure in Europe including in its Brexit negotiations, but the result leaves him vulnerable at home and needing to rely on other parties to pass legislation. The elections came two days after a Turkish man was arrested for shooting three people dead on a tram in the central city of Utrecht, an attack which right-wing parties have seized on to push their anti-migrant agenda. The coalition led by Rutte’s centre-right VVD party is set to collapse from 38 to 31 seats in the 75-seat senate, which passes legislation approved by the lower house. Rutte’s VVD is set to drop from 13 to 12 but the other coalition partners took a hammering with the left-leaning progressive D66 falling from 10 to 7 and the Christian Democrat CDA from 12 to 8, although ChristenUnie rises from 3 to 4. 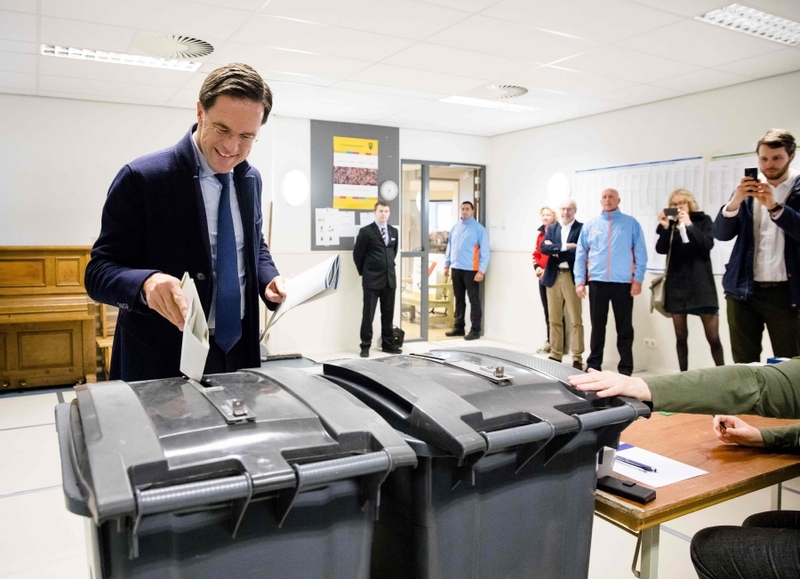 Baudet – known for controversial statements such as “women in general excel less in jobs and have less ambition” – led his party to win 10 seats, just behind Rutte’s party, the exit poll said. Long a standard bearer for the far right in the Netherlands and more widely across Europe, the bleach-blonde Wilders appeared to have lost seats to the newer figure of Baudet. Senate members will officially be decided in May by the 570 representatives elected to the country’s 12 provinces in Wednesday’s election. The young and telegenic Baudet faced criticism for his refusal to follow the lead of other parties and stop campaigning on Monday after the attack. The head of the Dutch socialist party had called the vote a “Rutte referendum“, although Rutte has said he will not step down if his coalition loses its majority and therefore needs help to drive through laws. However after nearly a decade in power, Rutte has been widely tipped to take up a top EU post in Brussels when the current set-up led by European Commission chief Jean-Claude Juncker steps down later this year. Exit polls also suggested a good night for GroenLinks – the leftist ecological party led by Jesse Klaver, a politician best known abroad for his strong resemblance to Canadian Prime Minister Justin Trudeau.